A few weeks ago after discussing with Luke Yelavich about what to work on in speech-dispatcher next I decided to take a stab at making it use GSettings for its settings. (You can see the work in progress here if you like.) I've used GSettings before for work projects so thought it would be a good/easy thing to take on. There are many advantages of using GSettings over plain ini-style files. Type checking (You can't enter a string for a numeric setting for example). Default values for settings defined in the schema(s). On that wip branch speech-dispatcher itself has been changed to use GSettings and also reacts to many setting changes dynamically. It doesn't react to changing the port type or port number or unix socket path dynamically, since we have no mechanism to tell client applications that it is changing. There are also GSettings schemas for the output modules, just need to make them read their settings from GSettings instead of the old ini-style .conf files. spd-conf also has been modified to write to GSettings rather than .conf files. That change alone reduced the spd-conf python script by quite a few lines of code and made it a lot easier to read. QSettings doesn't emit signals when a setting changes. (I found a few forum posts asking why this is with possible workarounds. Nothing built into QSettings though). QSettings doesn't have a schema for the settings themselves. There's no way to introspect a setting file to see what settings are possible. It just depends what keys the application reads. QSettings does have type checking, but no range checking or anything like that. I was a bit disappointed that QSettings that I've used for many many years is lacking these seemingly obvious and probably useful features. I wonder if we as a community implemented these features in QSettings if the Qt company would accept them. It's been over a year since I posted anything. That's way too long. So what's going on in the projects I care about lately? Speech-dispatcher will soon have a 0.8.5 release. There's a set of patches in the works on a branch on github that moves the audio to the server so we will be able to do useful things like label each pulse audio output with the client application name rather than a generic sd_espeak, sd_pico name for each output module. This way you'll see stuff like "Konsole speech", "Konversation speech" etc. volume controls for the speech volume control of the application's speech output. In order for this to work some other refactoring needs to be done in the espeak and other modules so stopping audio playback will be immediate etc. QtSpeech has had some work done. The android and windows versions have been seeing some love lately. I'm optimistic that it can be included in an upcoming Qt release. Though I'm not sure why it hasn't been included yet. KMouth has been waiting a QtSpeech release in order for it's kf5/qt5 branch to be merged to master. KNewStuff could use some work. There was talk at a recent conference about adding the properties and such necessary for it to be used from QML. I'll follow up on that and see what has become of it. All in all I feel like I haven't been around as much in the above projects as I'd like to have been. Life is busy and work is busy and such. I plan to spend a bit more time on these though. Even if it means I get slightly less sleep. Looking forward to a good rest of the year. Speech Dispatcher 0.8.3 is out now. I'll shamelessly post the release announcement e-mail below, but with this you can build and use QtSpeech for linux from the dev branch of qtspeech. It contains all the api QtSpeech requires for it's speech capabilities (QtSpeech is an optional dependency of knotifyconfig, knotifications, kanagram, khangman, and okular (frameworks version) as well as the replacement for Jovie. * What is new in 0.8.3? - Add API methods to get language, rate, pitch, and volume. - A lot of code cleanup, and compatibility improvements. - Fix some inconsistancy in the SSIP API for voice type. - The SET VOICE SSIP command is now deprecated, and will be removed in 0.9. - Fix a possible crash in the festival driver. * Where to get it? We recommend the use of sound icons with Speech Dispatcher. * What is Speech Dispatcher? and tries to provide the user with the most important messages. * How to report bugs? Please report bugs at https://its.freebsoft.org/its/issues/project/1876 . I meant to have a post about Gardening efforts next, but KMouth is improving lately, so I'll throw out a quick post about progress. KMouth master branch is now Qt3 free. 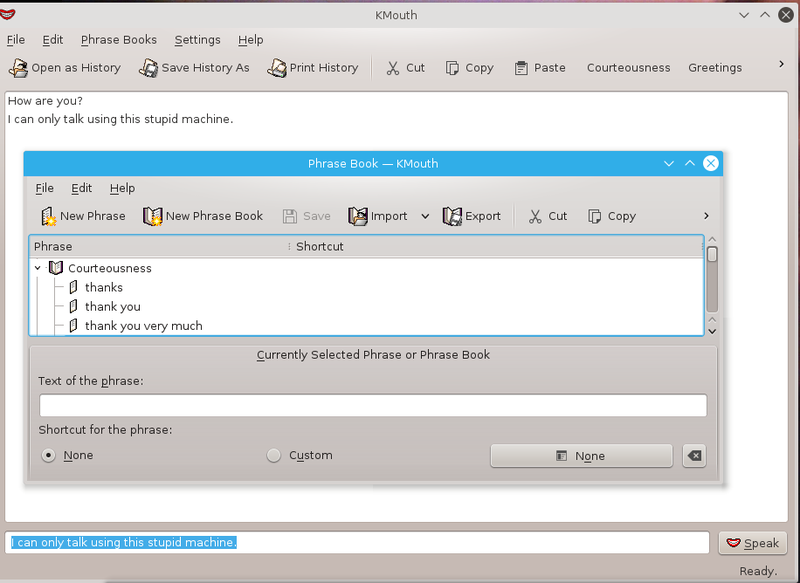 It's still using K3Process for the speech synthesizer command-line calls, but all Qt3Support is gone. In other news I started a quick Qt5/kf5/QtSpeech port of it on the frameworks branch. It runs, it speaks (with a bug fix in gerrit for QtSpeech). There's definitely room for improvement, but it's a good start I think. Note this wont be hitting master until after QtSpeech gets a release and KDE Applications depend on it (probably Qt 5.6). The KDE gardening team has chosen as it's next target for gardening the documentation/api websites. https://community.kde.org/Gardening/docwebsites The initial objectives are there on the wiki, but feel free to modify/update them if I got anything wrong or something is already in the works. The general idea is to improve these sites by getting kf5 based applications and libraries (which aren't frameworks themselves) apidocs, documentation, and code checks on these sites as they were in Qt4/KDELibs times. Another good objective is to make them work faster/better by not recreating everything each day, but only incrementally updating their content somehow if possible. And finally I'd like to get bug products/components for each of them so if issues are found we, as a community, can track the issues and fix them as a team. The plan is to focus on these over the course of April and May and at the end of May have a gardening day on a saturday to wrap it up like we did on the KRecipes gardening day. P.S. we'll be using #kde-devel for discussion of this project and how to help contribute, come join us and let's get some stuff working better in this area.